Flight Zone begins with an introductory clip that introduces the mission of locating the fuel tanks and capturing the most wanted enemy figures. It also gives a glimpse of the type of animations that are on display in the slot game. 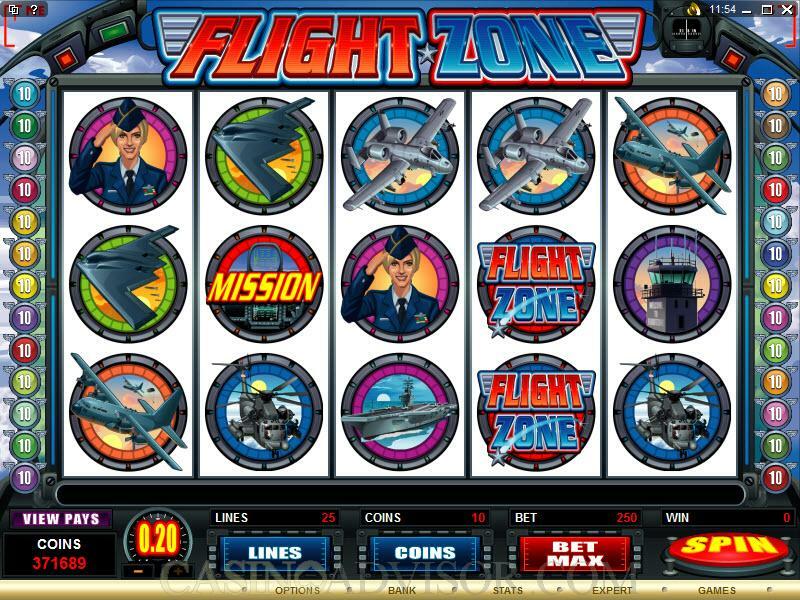 Flight zone is a video bonus slot. The wild symbol is the Flight Zone logo. The scatter Mission symbol triggers the bonus game and the scatter Scatter symbol triggers the free spins. The other symbols constitute a most awesome display of air force power. There are two pilots, five fighter planes, one aircraft carrier and one control tower. One of the highlights of Flight Zone is that each symbol is animated in winning combinations. The animations of the planes are fantastic. The planes zoom through the flight zone against a realistic backdrop of clouds with appropriate audio sounds. Some planes spew bombs and others drop parachutes. The other symbols though not as dynamic are realistic and detailed. The Flight Zone logo is also animated. A plane explodes through the logo as if breaking the sound barrier. The player has to first select the coin denomination. The available values are 0.01, 0.02, 0.05, 0.10 and 0.20. 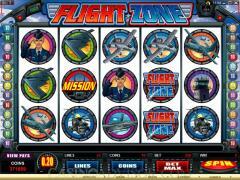 Flight Zone is a 25 payline slot game and the player has to decide how many of these he wants to enable. The final decision the player has to take before spinning the reels is how many coins per line he should wager. Flight Zone offers up to 20 coins per line. Based on these parameters the maximum line bet is 4.00 and the maximum total bet is 100.00. The Flight Zone logo is the wild symbol. It does not offer line payouts nor does it act as a multiplier. But on reels 2, 3 and 4 it appears as stacked wilds. This means that there could be two or even three wild symbols in a reel and this increases winning combinations significantly. There are two scatter symbols. These do not offer scatter payouts. The Scatter symbol triggers the free spins round when it appears simultaneously on reels 1 and 5. Ten free spins are offered at doubled payouts. Free spins can be retriggered in the free spins round as can the bonus game. 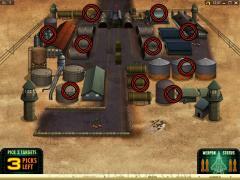 The Mission Bonus game is triggered by the Mission symbol appearing simultaneously on reels 2, 3 and 4. A plane dives down from above the cloud cover to the enemy camp on the full screen. The player has to select three tank locations. The plane fires missiles at those locations blowing up those tanks and winning credits for the player. Five most wanted enemy figures escape in a convoy and the plane chases them. The player chooses one car and the plane blows it up with its last missile. The player gets additional credits depending on the enemy figure killed. Players will want this game activated again and again for the animation it offers. Flight Zone also has the Gamble Game. Interested in reading more detailed information about Flight Zone? If so Click Here for more details.